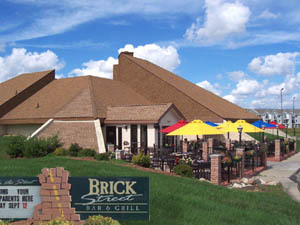 Brick Street is located at 1223 E. Grand Blanc Road, Grand Blanc, MI 48439-8845. It is just east of Fenton Road and just west of Dort Hwy. Coming from US-23 take Exit #88. Coming from I-75 take Exit #109. We are open for lunch at 11:00 a.m., Monday thru Friday. We open at Noon on Saturday and Sunday. For reservations call (810) 603-2114.